Mega Man is a robot creation of Dr. Thomas Light. He started out as a simple assistant robot named Rock, along with his sister Roll. When Dr. Wily reprogrammed six construction robots created by Dr. Light to obey his commands and turn against the very civilization that they were designed to help, Dr. Light knew something had to be done. Due to his programmed sense of right and wrong, Rock volunteered to be converted into a fighting robot. Thus, from that day forth, he became known as "Mega Man" (Rockman in Japan). Mega Man possesses many abilities that make him stronger and give him more endurance than an ordinary human. Two of his greatest assets are his cybernetic legs which give him tremendous jumping ability, and the Mega Buster affixed on his arm. But the ability which may possibly be his best, is the ability to copy and adapt the weaponry of opponents that he meets and defeats. This allows him to take a weapon from one enemy and utilize it against another. Mega Man can withstand a great deal of punishment, but he is not invulnerable. A health meter is visible at all times in the upper left corner of the screen. 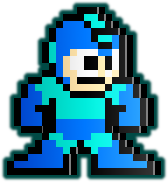 Mega Man begins each stage or new life with a full health bar. As Mega Man takes damage, this meter will decrease. He can replenish this meter by collecting health items. If the meter is depleted, Mega Man will lose one life. He will also die instantly if he falls through the bottom of the screen, or touches the deadly spikes that line certain floors. Mega Man has a supply of lives. He begins with two extra lives, and can earn more by collecting 1-Up items. If you lose a life and have more in reserve, you will either start at a stage checkpoint if you passed one, or from the beginning of the stage. If Mega Man runs out of lives, the game will be over. You will be offered the chance to continue as many times as you like, but there is no save or password system on the original Famicom/NES version, so you will lose any progress when you turn the machine off. For more details on this topic, see Mega Man/Weapons. Mega Man can acquire more weapons than just his default Mega Buster (his arm cannon). To do so, he has to beat a Robot Master. Weapons provide new ways of attacking, giving Mega Man projectiles that can move at different trajectories (e.g. vertically), a shield, and other effects. These weapons are particularly useful for defeating other Robot Masters in the game. Most bosses have vulnerabilities to one or more particular weapon. Knowing these weaknesses is key to forming a strategy for what order to take each Robot Master on. Mega Man's primary weapon, the Mega Buster, has unlimited ammunition so it will never run out. However, any weapons that he acquires from another Robot Master will have a limited supply. When using such a weapon, a second meter will appear along side Mega Man's health meter. This new meter will indicate how much supply of ammunition he has left to fire this weapon. With each use, the energy bar will be reduced. The rate of reduction depends on the weapon. Ammunition can be collected by collecting ammo items. These items can be used to replenish any weapon, but Mega Man must be actively using a weapon in order to collect more ammo from it. Collecting ammo while using the regular Mega Buster has no effect. All ammunition is automatically restored if you die and continue your game. The game over screen is a blue screen that shows your score. Two choices are given: continue, receive a password, or select a level. If you choose to continue, you will begin at the start of the level you were just playing. If you select a password, you will be presented with some dots present in a grid. Record the location of these dots and then restore them on the password screen when you wish to resume your game. Otherwise, you can choose to select a new level. This page was last edited on 9 December 2015, at 15:02.